WASHINGTON (Sputnik) - The protests will be staged on or around February 23 to coincide with the 115th anniversary of the opening of the Guantanamo Bay Naval Base, where the military prison is located. Co-coordinator of the United National Antiwar Coalition (UNAC) Joe Lombardo told Sputnik that Anti-war activists in the United States would stage a series of protests across the country this month to demand the closure of the notorious Guantanamo Bay military detention center. "The antiwar movement in the US is gearing up for protests in cities across the country to demand that Guantanamo be closed and the land be returned to Cuba,” Lombardo said. "The United States has no right to have a military base in a country where the government does not want them to be,” Lombardo added. "This, in itself, is an act of aggression. It does not make the people of the US, Cuba or the rest of the world safer, but brings us closer to war." The United States may transfer new detainees to the Guantanamo Bay prison in Cuba if needed, according to the executive order signed by Trump. Moreover, Decisions about what will happen to terrorists detained at the Guantanamo Bay Naval Base will be made on a case-by case basis, the White House said in a release following Trump’s signing of the executive order, titled "Protecting America Through Lawful Detention Of Terrorists." Lombardo said Trump's decision on Guantanamo dovetails with a broader administration strategy of US military expansion and aggressive foreign policy. "Under Trump, the US military budget has been expanded, as has NATO, and the US military presence in Asia and Africa. The US is now proposing a permanent military force of 30,000 troops in Syria, has provocatively declared it will move its embassy to Jerusalem and is continuing its threats at N. Korea and Iran,” Lombardo said. 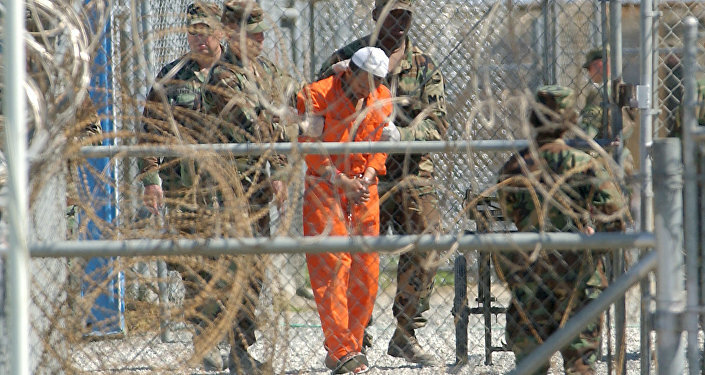 “The decision to keep Guantanamo open is a continuation of this aggressive posture." In 2014, the US Senate Intelligence Committee produced a 6,700-page report that detailed appalling incidents of wrongful detention at prisons run by the Central Intelligence Agency, including a CIA facility at Guantanamo. Prisoners were routinely subjected to "brutal" abuse, including water boarding, extreme sleep deprivation and forced rectal rehydration, according to the report. In December 2017, United Nations Special Rapporteur on Torture Nilis Melzer criticized the United States for failing to hold the perpetrators of the abuse accountable and reiterated a long-standing request to visit the Guantanamo detention facility and interview detainees. The demonstrations come on the heels of US President Donald Trump's announcement that he signed an executive order to keep the facility open. Former President Barack Obama tried but failed to close the Guantanamo detention center, which gained worldwide notoriety after evidence emerged of widespread torture and abuse of detainees.